Blue Hors Matine, the horse dubbed the ‘Dancing Mare’, in a previous post, died today at age 13, after breaking her leg in the field, at her home. The Danish Warmblood mare had been retired last August, after Las Vegas World Cup Competition, in 2009, when she slipped while off loading her trailer. She suffered long term tendon injuries. Blue Hors Matine was expected to continue as a broodmare. The horse forums around the world are saddened by this unexpected turn of events. 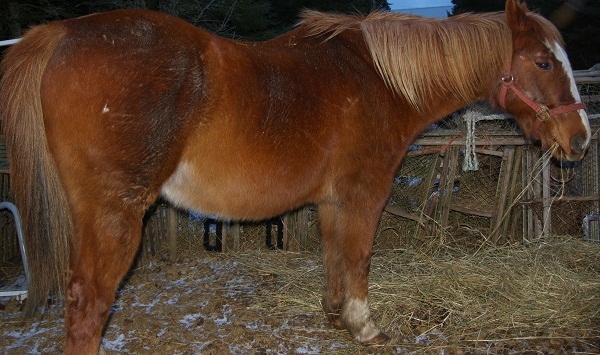 People think she was in foal and due to give birth soon. 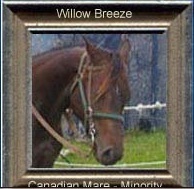 But I read on one site that she was to be inseminated this coming spring by another of the Blue Hors horses. To me, it just didn’t make sense that they not attempt to save the foal. It would have been difficult but surely conceivable. I believe her impending motherhood was nothing more than a rumor. An error on the part of one of the news wires. She was in her home field with her buddy Blue Hors Cavan, when a passerby noticed that she had been injured and reported it to the stable staff, it was said. The veterinarian put her down because she had broken her off foreleg at the knee joint, shortly after. What a sad day for the world of the show horse! Accidents happen, but strangely enough I feel somewhat disconnected and at a loss because of the death of Matine. I will never have the chance to meet her and watch as she dances her way into more hearts. I feel almost like I’ve lost one of my own. What a sad day it is, indeed! 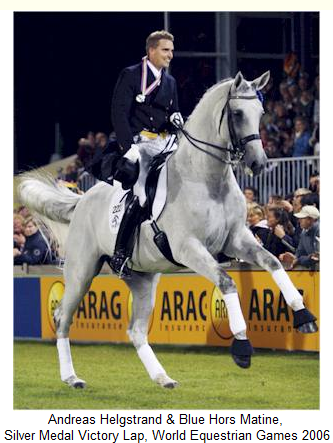 The mare sky-rocketed to fame after winning the 2006 World Equestrian Games in Aachen, winning the Grand Prix Freestyle with Andreas Helgstrand. The following video is the winning ride. 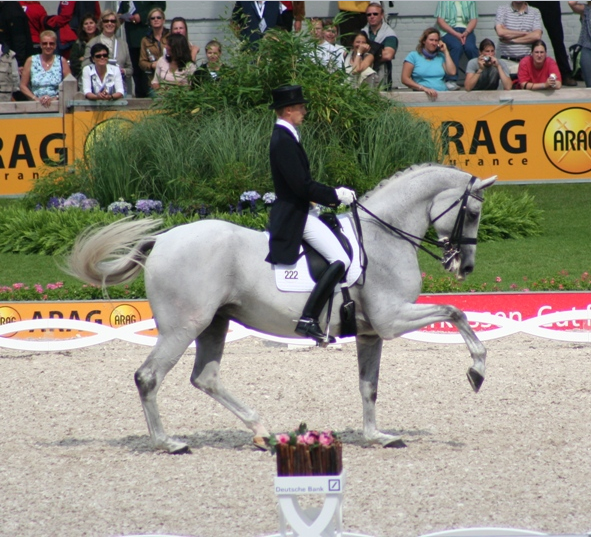 Blue Hors Matine, by Blue Hors Silver Moon also took the Bronze at the games for the Grand Prix Special. This video has seen around 10 million views to date, since it was put up on YouTube. I imagine it will be seen by another 10 million now that she is dead. We live in Canada and I think, this time of the year, everyone becomes concerned about their horses and their neighbours horse too. Here on the islands, there are very few horses left amongst the people. On this island, Coffin Island, there are presently ten horses, five of which are mine. Last year there were three, all of which were mine and so on for many years. Before I got Copper, there hadn’t been any horses here since I was young. What I am saying is that people in general around here don’t know about the needs of horses and some are very agitated that I don’t have a barn. I have shelter in the form of a large greenhouse structure covered in undamaged heavy duty plastic and a smaller temporary car garage, as well as many acres of spruce, pine and fir forests, that have thick, interwoven tops and no branches on bottom. These forests groves are surrounded by very thick spruce and fir underbrush and young spruce trees trying to find light to grow. They are so thick that our cat as difficulty picking her way through them. 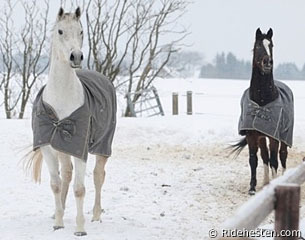 I also have two sets of winter blankets for each of the five horses, just in case they are needed. One blanket is thick synthetic filled multi-layer, with a fleece liner and the other is an impermeable or a water-proof garment. Granted I try to not use the blankets often because I want the horses coats to come to their full potential for warmth, but I don’t take any chances on any of the horses getting cold either. Another thing is that I and my son take turns, feeding all the horses, sometimes every hour around the clock, when the temperature really drops or it becomes a wet, windy day with temperatures hovering around the freezing mark. These are the worst days for my horses. Often they are standing belly deep in hay while other times the horses use the greenhouse, particularly if I put the food inside. But because the warmth in the greenhouse, winter coats tend to get stunted and extremely dirty and dusty, so although I used the green house frequently three winters ago, I found that last year the horses were happier outside and I had less conflicts amongst them. The flapping, snapping plastic, in the highest gale wind, doesn’t bother them in the slightest, which surprised me greatly. I thought it would spook them badly. Yes, I’m up out of bed and out with the horses, throughout the night. I’ve been known to fall asleep while laying on a soft, warm back at 30 degrees below zero Celsius, only to have a rude awakening, face down in a snow bank, when Copper decided to shift his weight to the other foot. I don’t do that anymore. Instead, I keep fresh hay with them constantly and bring water, warmed from the kettle on the stove in two and a half gallon buckets to each and everyone of them separately, a half a dozen times a day, throughout the winter. I try to get at least ten gallons of water into each horse per day. My original three, Gimme A Dream, Frilly and Willow drink up to 15 gallons a day each but the newest older guys, Bonanza and Shaman drink only a couple of gallons per day. I have salt blocks and more recently large 24 kg mineral blocks set out to encourage the intake of water. They prefer the mineral blocks but I keep the salt blocks out, just in case they want a change. Gimme A Dream, Willow, Frilly and Bonanza all have a high body condition score, about a 7, but 28-year-old Shaman has less. He is not a thin horse, in fact he is the best conditioned horse I have here. The others are fat, FAT, fat and with bigggggg hay bellies. They are so out of condition now (I am so ashamed of myself) but as the days grow longer and the temperatures start to rise, I shall start to cut their meals from them slowly until I’m feeding them tree times a day and give them less hay per feeding until they get about forty lbs each per day except for Gimme. He will continue to get more because of his great height and normal weight. And I shall be riding them again. They are retired from riding for the winter because I keep them barefoot all year round. 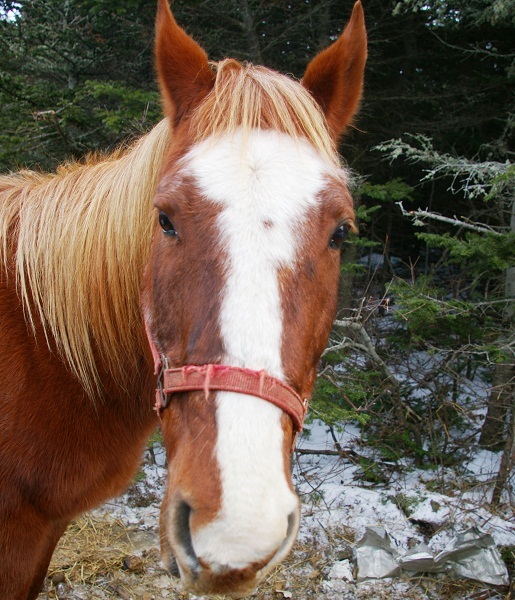 Twenty-four year old Bonanza is around 15 hh, extremely sound and full of energy. He is extremely gentle and loves his humans but only after he gets to know them. He is nervous of new activities or lots of people in his presence. If I were to make a stab in the dark about his breeding, I would say that he was Halflinger because of the thick, heavy-weighted cannon bones and indeed his entire leg structure. Bonanza is a wonderful horses but for some reason, I want to call him ‘George’ and I’ve bit my tongue more then once trying to stop that thought. He reminds me of a George. Twenty-six year old Shaman was slated to be put to sleep this year. Apparently he was in bad shape and had probles walking. He was in serious pain. Shaman and Bonanza were the last of a riding center’s 30 some odd trail horses, which closed its doors a few years back. 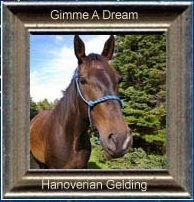 The owner kept four of his favorite horses but finally sold two very early in 2009. 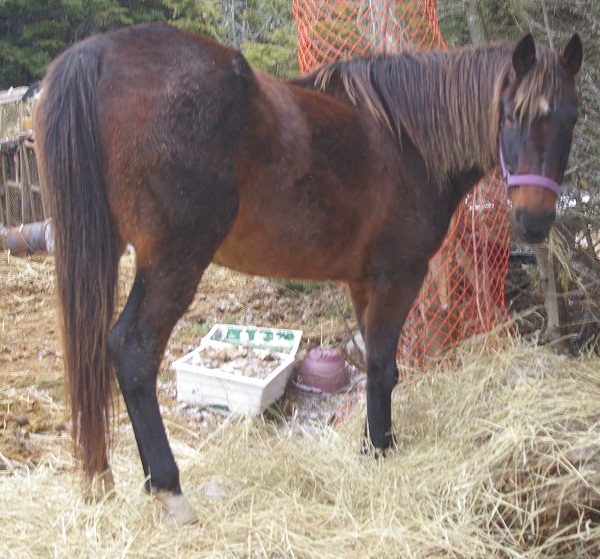 Bonanza and Shaman were left to fend for themselves on a large acreage of hilly land. When I put out the word that I wanted a young female 14.2hh Canadian, their owner asked if I would consider Bonanza because he was putting Shaman to sleep and didn’t want his favorite horse alone. 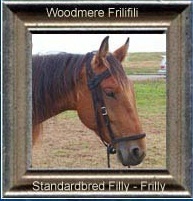 He had seen me with my three, Gimme A Dream, Willow Breeze and Woodmere Frilifili and apparently liked what he saw. He went into the field with the and found a healthy curiosity about his presence. He said they were contented horses and he was/is right. I asked for a week to decide about Bonanza because he wasn’t what I was looking for. But when what I wanted didn’t turn up, I phoned him and said I would take Bonanza for the winter. Before he brought Bonanza to me, he called and asked if I would board both Bonanza and Shaman for him for the winter. Whoa now! This I’d have to check out. When I went to see his horses for the first time, Bonanza wouldn’t even let us near him. He’d canter with his head held high and his tail held even higher. Lord he was stunning! But he wasn’t the horse I went to see. It was Shaman who was having the problems and I wanted to make certain I could handle anything that might arise. It looked to me that Shaman had broken or severely damaged his stifle or as they say, “Shaman was stifled”. Since I’ve already worked with repairing the stifle in other horses and Shaman was capable of walking, with a limp, I decided to take the two for the winter. I have the instructions to have the veterinarian put him down, if he develops problems I can’t handle. Barring accidents, I don’t think it will happen. You see, I have the inflammation under control and he walks, trots and canters as well as the rest of the horses now. 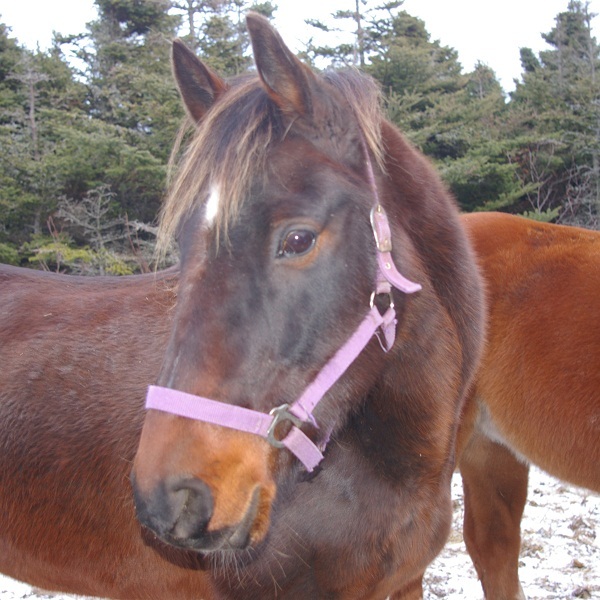 Bonanza and Shaman arrived during the night of the worst snow and ice storm of the year. Bonanza was soaked with nervous sweat and had to be heavily blanketed. They both refused food and water for a couple of days but they eventually gave in, accepting potatoes at first. I love giving my horses potatoes and do so frequently, knowing that potatoes will help with any arthritic inflammation that might be present. Within a week, Shaman was showing no signs of a limp what so ever and hasn’t regressed over the passed three months. I’m so pleased with the old horse, even though I kept calling him ‘Shamoo’. Again, I bit my tongue a hundred times to stop my thoughts and call him by his right name. Shamoo is a killer whale in Sea World in Orlando, Florida. Dogs have Masters, Cats have Staff but Horses…, Horses have Slaves! With two more horses added to my small herd, 24 year old Bonanza and 26 year old Shaman, and no traditional stable, I needed more winter horse blankets. I have blankets for Dream, Willow and Frilly but after so many years of use, they were worn and torn and had been repaired so many times that the repairs wore out and had been repaired. I searched the web to find the cost of the type of blanket I wanted. I wanted something that was heavily layered for warmth, soft so that there would be no rubbings if I had to leave them on several days and light weight because I had to carry, wash and dry them. The cheapest winter horse blankets that I considered a possibility was $250 US. But of course I wanted the S475 blankets. 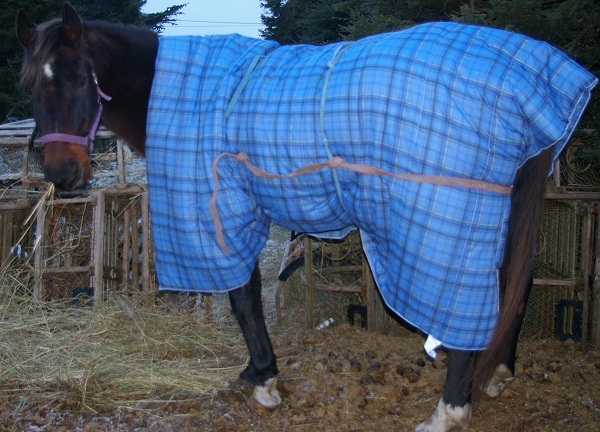 No way – no how could I pay that kind of money for blankets that were going on horses who ripped through forest branches like they were on a race track. So I decided I’d wait and buy synthetic duvets when they came on sale in January. We always have good winter sales in January. Harts, a discount store, had queen-sized comforters for sale for $16.69CDN last week, so I bought five of them. Here is the start to my homemade winter horse blankets. First, I put the blanket up on Shaman, he was the first available horse around, to take measurements. I strapped it down with macramed reins I have laying about. I put dots with a marker at strategic places to say where I needed straps, ties and buckles. Also, I wanted to know where I had to cut out the area for the neck and raise the area for the tail. I may do the tail section, but it won’t be needed. I’m not going to cut out the neck section because I found that I could roll back the neck into a decent looking shawl collar and it could be rolled up the neck for warmth, if necessary. Notice that they are large enough to close completely under the belly but still leave room for the males to relieve themselves. I made a drawing to see where I would have to put the straps, hooks, rings and anything to make the blanket more durable. 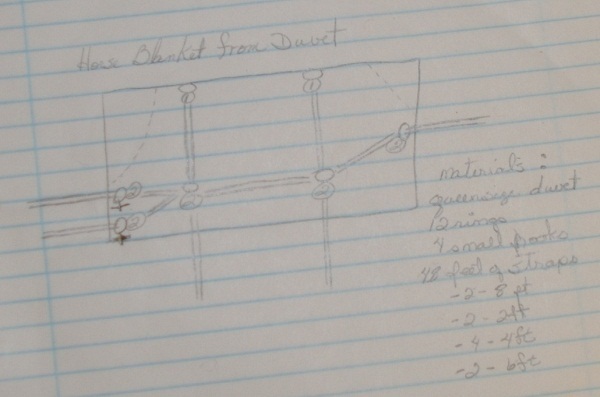 I also calculated ow many feet of strapping I would need for each blanket. Then I got out all the different pieces of hardware I had to determine if I had enough to complete the blankets and what other things I would need to buy. 4 – 4 foot straps, for the front (these I a making long for tying because finding good solid buckles has always been difficult for me and I have none available nor are there any on the islands). 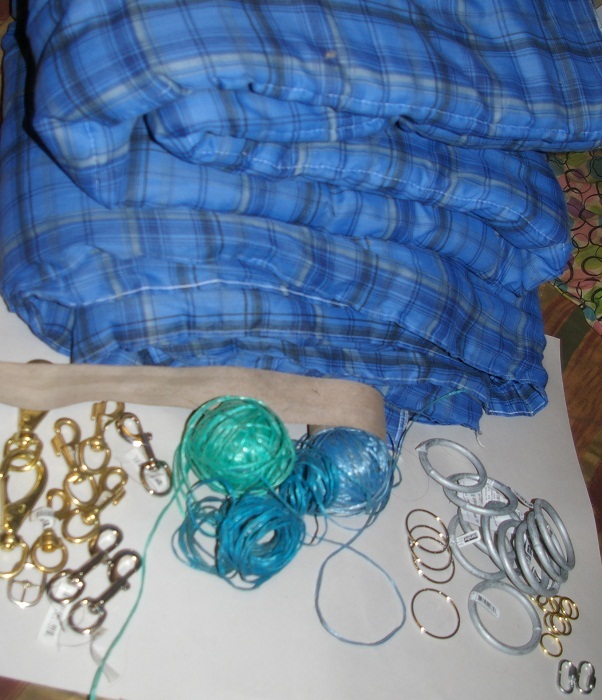 What I have are the duvets, hooks of multiple sizes and the ability to buy more, rings of various sizes made of brass, stainless steel and galvanized, seat belts from cars (I went to the dump and asked for the seat belts off the vehicles they were going to crush for scrap metal), and miles and miles of baling twine. Now I get to put it all together, before the next winter storm, which isn’t in the forecast yet. What I haven’t added here and there is a good possibility of my doing so are cross over straps between the hind legs to keep the blanket straight on the back of the horse. That will add 4 more hooks and 4 more rings plus waist band elastic long enough to keep it in place but yet still be comfortable. Also I might have to add heavier material in strategic places for make the blanket more durable. I have already bought enough material that is normally used for heavy duty rain jackets and made it into a water proof nylon outer shell for the winter blankets. These are chocolate brown with a dark sand layer on the bottom and dark sand colored binding. When I finish the first blanket I will put up the finished product.